On International Yoga Day, the Russian version of Yoga Journal hosted a “yoga marathon” bringing together yogis and instructors of different styles for a good cause. 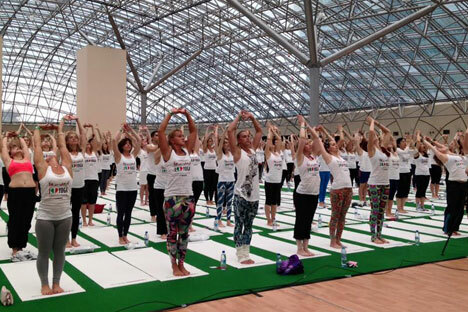 On June 21, Moscow yogis celebrated International Yoga Day with a “yoga marathon” of 108 sun salutations. The annual event, hosted by the Russian version of Yoga Journal for the fifth time, is also a fundraiser. Yogis registered on the yoga marathon website and asked people to sponsor their participation in the event. This year's marathon raised $18,000, which will be used for spinal surgeries for four sick children. As part of the yoga marathon, Yoga Journal invited 10-12 top yoga instructors to lead a portion of the sun salutations in their preferred style. Jay opened his studio in 2013 after a Russian couple he met in Bali invited him to visit the city. “Back in 2010, when I was living in Hong Kong, I sat down and made a ‘dream board,’ cutting out pictures from the magazines,” Jay said. Dream or vision boards help people fulfill their dreams by visualizing them either by putting images and words physically on a board or through a web app.